QuiltRef [App Store link] is a free mobile quilt reference app that is not just for quilters, but for quilt fans too. This utility for the Apple iPhone and iPod touch provides useful information whether you are in a quilt shop buying fabric, at a quilt show admiring others' handiwork, or hunting antique quilts at auctions and yard sales. For the quilter, the Setting Triangle feature will compute the sizes of setting triangles, those shapes needed to fill in the "holes" left around the edges of a quilt when setting quilt blocks on point, at a 45 degree angle. The Conversion feature will convert measurements between inches, yards, and centimeters. It also includes a table of common fractional yard measurements and the equivalent number of inches. 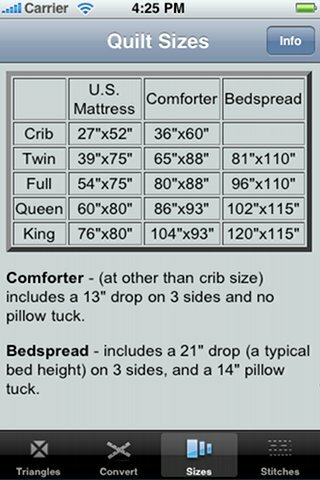 A feature for both quilters making quilts and quilt fans acquiring them is the Quilt Size table of common bed and quilt sizes that helps you select a quilt that will give you the look you want on your bed. 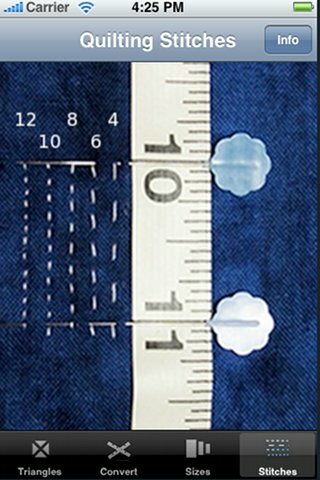 The Quilting Stitches feature offers a visual reference so you can compare the full-scale photo of sample stitches to actual quilt stitches on a quilt you are examining and quickly estimate the number of stitches per inch, which is one of the factors in evaluating a quilt.